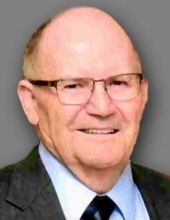 Harry J. Revelle, 85, of Energy, formerly of Zeigler, passed away 11:15 p.m. Friday, September 28, 2018 at Reflections of Herrin with his loving wife and family at his bedside. Harry worked for Herrin Unit # 4 School District for 38 years, starting as a teacher, principal and retired as an Assistant Superintendent in 1992. He is a member of the Second Baptist Church in Herrin. Harry was a veteran of the U. S. Air Force. As a hobby, he loved to work with wood and leather. Harry was born October 22, 1932 in Zeigler, IL to Harry Edgar and America Elizabeth (Barnhill) Revelle. Harry was united in marriage with Joann Farthing on April 19. 1957 at the Christian Church in Zeigler. Surviving are his wife of 61 years, Joann Revelle of Energy; two sons and daughters-in-law, Bradley J. and Jackie Revelle of Rock Hill, SC, David A. and Julie Revelle of Aiken, SC; two daughters and sons-in-law, Debbie Kay and Deon Randoll of Marion, Jill R. and Scott Elliott of Herrin; ten grandchildren, Andrew Randoll, Ethan Randoll, Carson Elliott, Mandy (Gage) Chandler, Emily (Evan) Ehrenheim, Beth (Caleb) Snider, Casey Revelle and Robert Konzelmann, Ashley Randoll, Erin Elliott and Jordan Elliott; two great grandchildren, Chloe and Coen Chandler; sister and brother-in-law, Priscilla and John Fuesting of Collinsville and several nieces and nephews. He was preceded in death by his parents and three sisters, Elizabeth Ann Walker, Lela Ellan Lucas and Harriett Fern Revelle. Services will be 11:00 a.m. Tuesday, October 2, 2018 at Meredith-Waddell Funeral Home in Herrin with Rev. David A. Revelle and Rev. Matt Frizzell officiating. Visitation will be from 5:00 p.m. until 8:00 p.m. Monday, October 1, 2018 at the funeral home. Interment with military graveside rites conducted by the Herrin American Legion Post # 645, Carterville American Post # 347, Baker-Ladd V. F. W. Post # 1567 and the Scott Air Force Base Honor Guard will be in Zeigler Cemetery at Zeigler, IL. Memorial donations are preferred by the family and may be made to Hospice of Southern Illinois, 204 Halfway Road, Marion, IL 62959 or to the Second Baptist Church, 900 South 11th Street, Herrin, IL 62948; envelopes will be available at the funeral home. To send flowers or a remembrance gift to the family of Harry J. Revelle, please visit our Tribute Store. "Email Address" would like to share the life celebration of Harry J. Revelle. Click on the "link" to go to share a favorite memory or leave a condolence message for the family.